The incumbent mayor of Rochester, N.Y., currently up for re-election, has decided to take indirect credit for a low-cost internet program loaded with tricks and traps from a cable company that is worsening the affordable internet problem in the United States. Mayor Lovely Warren made the head-slapping mistake of teaming up with Charter Communications, already on track to being even more universally despised by its customers than its immediate predecessor Time Warner Cable. Casting political instincts to the wind, Warren decided to team up with an unpopular cable company that is gouging its regular customers while offering a token “low-cost” internet program designed to protect Charter’s internet profits more than offering low-income customers a break. New low-cost, high-speed broadband Internet service is being launched in Rochester, Mayor Lovely Warren announced Thursday. 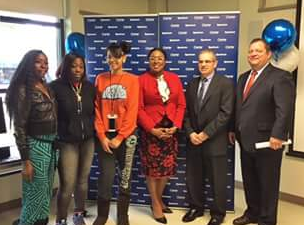 PowerMyLearning and Charter Communications announced Spectrum Internet Assist (SIA) would offer the service to eligible low-income household customers in Rochester. Broadband speeds of 30/4 Mbps are being offered for $14.99 per month by SIA, according to Mayor Warren. We agree with the mayor that lowering the cost barrier is critical to making essential internet service available to every resident. Unfortunately, Charter Communications is making the problem worse, not better. Charter’s idea of charity doesn’t seem so magnanimous when you read the fine print. Charter’s solution for affordable internet: Charge most customers more while a select few jump through hoops for a discount. First, Spectrum Internet Assist is highly discriminatory and only available to families with school age children that qualify for the National School Lunch Program. Don’t have kids? Tough luck. When they leave school, no more affordable internet for you! Second, if you are a senior citizen on a fixed income, you probably already have 20+ years under your belt dealing with relentless rate increases from the local cable company. Unless you are 65 or over and receive SSI benefits, you’ll keep on paying those rate increases because the only thing Charter has on offer for you is a bigger bill. Third, and the most egregious insult of all to the most vulnerable members of our society is Charter’s cynical fear its fat internet profits will be cannibalized if they simply lowered the bills of customers that would otherwise qualify for this program. Spectrum Internet Assist is for new customers only (and if you are still on a Time Warner Cable plan, you aren’t a new customer). Charter refuses to relent on its policy requiring current customers to disconnect internet service for a month before they can qualify for Charter’s “charity.” The company is worried it will lose money from customers downgrading to Spectrum Internet Assist who will pay a lot less for internet access. To prevent that, Charter makes the process of enrolling as difficult and inconvenient as possible. Imagine if RG&E or National Grid demanded poor residents go without heat for 30 days before qualifying for heating assistance or if your elderly grandparents had to disconnect telephone service for a month before qualifying for Lifeline. While obsessing about whether its poorest customers are taking ‘unfair’ advantage of a money-saving deal, Charter has no problem splurging on fat bonuses and compensation packages for its top executives. In fact, the highest paid CEO in the United States in 2016 was Thomas Rutledge, top dog at Charter Communications, rewarded with a splendid $98.5 million compensation package for finding new ways to charge consumers even more for cable service. Charter can certainly afford to lighten up on its customers. Instead, it seeks to live up to the cable industry’s usual reputation of a modern-day reboot of Oliver Twist, this time starring Rutledge as Fagin. Since Warren wholeheartedly endorses Charter’s paltry efforts for the poor, perhaps residents can call her up and ask why they should be forced off the internet for a month just to qualify for Charter’s “charity.” Or maybe not, considering the fact she had nothing to do with Spectrum Internet Assist beyond having her picture taken at a press event. As is too often the case, uninformed politicians are quick to take credit for programs they don’t understand and are nowhere to be found when the real problem-solving and hard work needs to be done. How can we say that? Because we were a registered and very involved party in the New York Public Service Commission’s review of the Charter-Time Warner Cable merger deal. Mayor Warren wasn’t. We fought for pro-consumer benefits if such a deal was to be approved. Mayor Warren didn’t. We understood from long experience the cynicism that separates the cable industry’s lofty words from its fine print. She doesn’t. Spectrum Internet Assist does very little to resolve the problem of internet affordability. The program is a close cousin of Comcast’s much-criticized Internet Essentials program, which has similar eligibility requirements and has proven cumbersome to sign up for and leaves too many eligible families behind because of its onerous signup requirements. In 2016, Comcast itself admitted that since 2011 it has only enrolled 750,000 low-income households in its discounted internet program, although more than 2.6 million families were eligible to sign-up but never did. Charter makes internet affordability worse. Our research shows that Charter’s token efforts for the few are more than canceled out by the rate increases and reduced options made available to the rest of its customers. 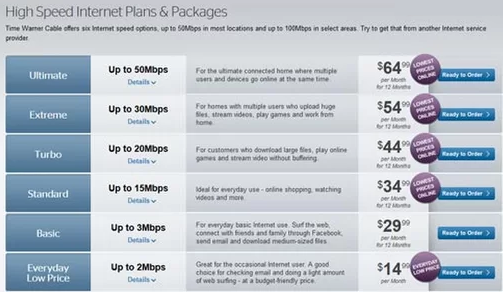 Time Warner Cable used to offer lower-cost internet plans. So which company makes internet affordability a bigger problem — Time Warner Cable, which sold less expensive internet service at prices of $14.99, $29.99, and $34.99, or Charter Communications which advertises only one internet plan on its website for much of western New York – 60Mbps for $64.99 ($44.99 if you are new to Charter and not a previous Time Warner Cable customer that still has cable service). 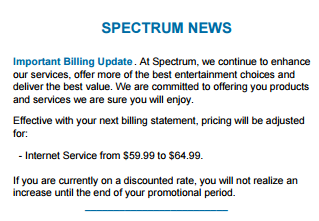 Spectrum’s plan is more than four times more expensive than Time Warner Cable’s previously well-advertised $14.99 plan. Regular TWC broadband-only pricing in 2016. No organization worked harder than Stop the Cap! to keep Time Warner Cable’s $14.99 Everyday Low Price Internet tier as a condition of the merger. While not fast, it is affordable and available to every customer, not just the small percentage that will eventually manage to qualify for Spectrum Internet Assist. Fortunately, New York’s Public Service Commission agreed with us and insisted that option remain available in New York State for the next several years. But Charter has subsequently made that plan almost invisible, removing all mention of it from its website, telling some customers it was not available, and leaving a distinct impression they don’t want customers to sign up. Charter’s one-size-fits all plan got more expensive in February. The reason is simple. Revenue cannibalization. Thomas Rutledge has repeatedly stressed to Wall Street investors he intended to end the “Turkish bazaar” of Time Warner Cable’s former cavalcade of plans and promotions. When a customer called Time Warner to complain about their bill, there was always room for negotiation and a better deal. Customers calling Charter looking for a break are hitting a brick wall with “take it or leave it” pricing, and tens of thousands of customers are “leaving it” and Charter behind. In this area, we don’t have that luxury because the alternative is usually Frontier Communications’ dreadful DSL service, which almost never meets the FCC’s definition of broadband — at least 25Mbps. To give you an idea of just how rapacious Charter’s broadband pricing is, consider local upstart competitor Greenlight, which offers fiber to the home service to a very small number of neighborhoods predominately on the east side of the Genesee River. It charges a no-nonsense $50 a month for 100Mbps internet — $15 less than what Charter charges for 60Mbps. If you want gigabit speed, Greenlight will sell you 1,000Mbps for $100 a month, which is $5 less than Charter’s unadvertised 100Mbps offer ($104.95/mo with a mandatory $199 setup fee). Ten times the speed for less. No wonder their Facebook page is filled with people begging them to expand. Rochester, like other cities in the upstate region, continues to fall behind with inadequate and costly internet service, insufficient competition, and no sign of gigabit speeds arriving anytime soon, unless you are lucky enough to live in a Greenlight service area. Those kinds of 21st century internet speeds are years away if we continue to depend on the local cable and phone company. In the local mayor’s race, one candidate seems to understand this problem and has a credible solution that fixes it. Rachel Barnhart has a long history of advocating for a citywide public fiber broadband network that would wire every home in the city for an estimated $70 million. 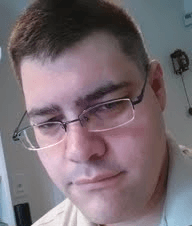 The costs would be shared by city residents, the Rochester City School District, and at least one private vendor that would likely be responsible for administering day-to-day operations. City taxpayers have already paid for a underutilized institutional dark fiber network. Barnhart proposes putting that network to work for the community, selling competitively priced gigabit service for residential and business customers that would effectively subsidize free, slower-speed service for the less-fortunate. Is it expensive? Perhaps. But is it out of line when one considers in one local suburb this year, taxpayers will spend $1 million dollars on a single traffic light and minor road widening project to better manage traffic. Considering how many communities need digital highway traffic improvements, this kind of investment is hardly audacious and isn’t just about giving people fast internet. Managing the local digital economy with the right infrastructure is essential in a community that has seen the loss of tens of thousands of manufacturing jobs and has been economically challenged for years. The alternative is what we have now — watching a mayor impotently smile at a manufactured press event declaring victory while the near-cable monopoly local residents have for broadband service throws *-laden scraps at the public and calls it a day. Politicians would do well to remember the sage advice we’ve given consumers since 2008. When a cable company claims they have a better deal for you, watch your wallet. For Mayor Warren, she will have to learn the same lesson we taught city councilman Adam McFadden and Assemblyman Joe Morelle. With friends like Charter/Spectrum or Comcast, you don’t need any enemies. the power to do something about it. if they get out here to were i am they can set the hoops on fire ill jump through them. the restoration in se texas is not fast its more a when we feal like getting to you we might offer servicce. i am sick of spectrum time warner what ever the hell they want to be called. i live at a nice spot with no dsl no cable hell as of this month i cant even get dialup here now(actualy it maxes out at 6kbs top speed)!! SSI is a Federal regulated program and to qualify you must be 65 years or older, OR disabled but lacking the work history to qualify for social security disability. What gives Spectrum the right to discriminate? What about the OR disabled part? I have this problem with Spectrum. I would have to cancel and wait 3 months and I would if I didn’t need my internet and the sabres games. they always get the little guy. I live in a large senior apt. with no choices but Spectrum and no discount for seniors. So they hold 120 apts. 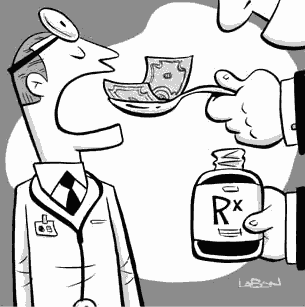 hostage to their greed.